Now that Ubuntu Feisty (which will be version 7.04) has just entered beta I decided to take the plunge and upgrade my home machine to it – having done a full backup of all my data onto two different media first! The upgrade itself went fairly painlessly, apt-get dist-upgrade did its usual magic but I got caught with a corrupted /var/lib/dpkg/alternatives/x-window-manager file (containing just NULL bytes) which stopped the kwin package from configuring. Now that may sound catastrophic but in fact apt is very good at working around problems, it carried on happily configuring anything that didn’t depend on kwin so at the end I just had to remove the corrupt file, tell it to upgrade again and that solved the problem. Package kwin is not configured yet. Package x-window-manager is not installed. 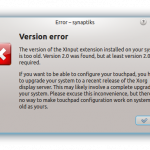 Package kwin which provides x-window-manager is not configured yet. A reboot and I was running Feisty with the 2.6.20 kernel! Now I was already running KDE 3.5.6 on Edgy thanks to the Kubuntu folks, so it didn’t look that different – some of the icon effects had changed marginally but it all felt a lot snappier – hard to tell if that’s due to the new kernel or library changes but certainly a nice surprise. Everything works as before (always a bonus with a beta release) and the only downer is that the system currently takes about 50s longer to boot than the Edgy. Turns out that is a known problem (( Ubuntu bug #92647 )) that existed in the upstream hal daemon (( Freedesktop.org bug #10364 )) and is already fixed in their git repository. What happens is that for each logical volume it discovers it registers it with the device mapper and forces a 1s wait before carrying on. When you have lots of logical volumes (as I do) this becomes quite significant! Other than that I’m impressed by it – I generated a bunch of benchmark figures from testing various filesystems under it (including ZFS) which I’ll post separately. I have been using Feisty since Alpha 3 (Herd) and I’m really glad that I’ve upgraded. It has been really stable so far and the final release is going to be great! There is now an update to HAL in the feisty backports that fixes the long time it takes to start up. Will update the story now.